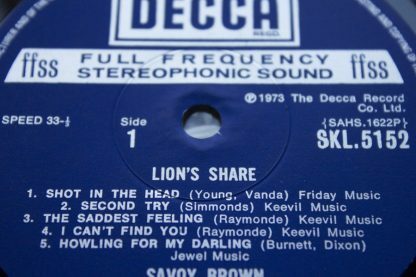 1st UK Cat No SKL/5152 1st Issue Boxed Decca Labels! Earliest -1W -1W Matrix Endings! Earliest “1” to “1” Mother Stampers On Both Sides! 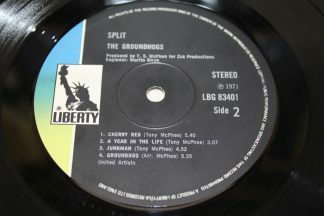 “1” G” Stamped on Side One “1” “G” Side Two! Stunning Near as Mint Audio Quality! Looks and Sounds Barely Ever played In My Opinon! (Barely a Spider Trace Can Be Seen Around the Spindle Hole)! Complete With 1st Issue Laminated Front Only McNeil Press Cover! 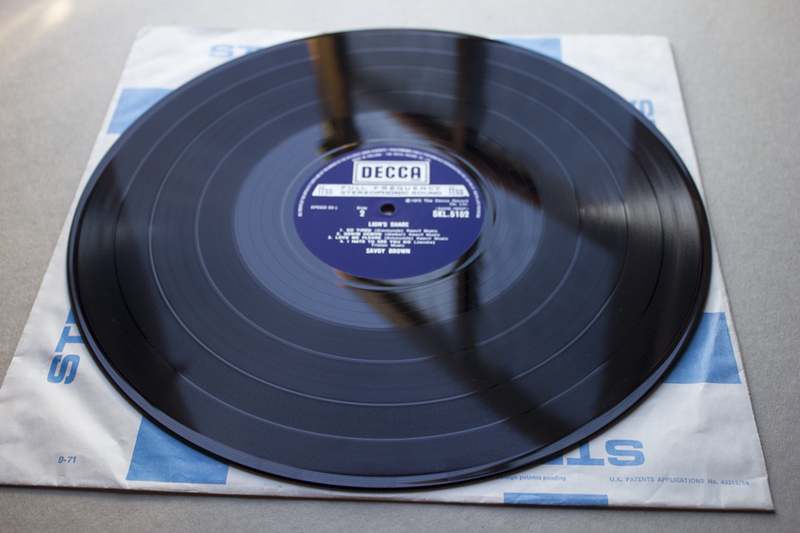 A Stunning Blues Audio Archive Copy ! 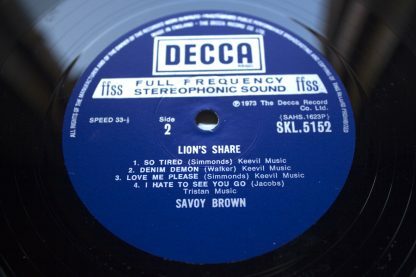 Savoy Brown “Lions Share”1973 The original 1st UK pressing! On initial inspection the vinyl looks superb. I find it hard to see any visable spider marks around the spindle hole, so it is obvious to me that this has barely ever been played at all. So rich and vibrant it nearly shook the house down. 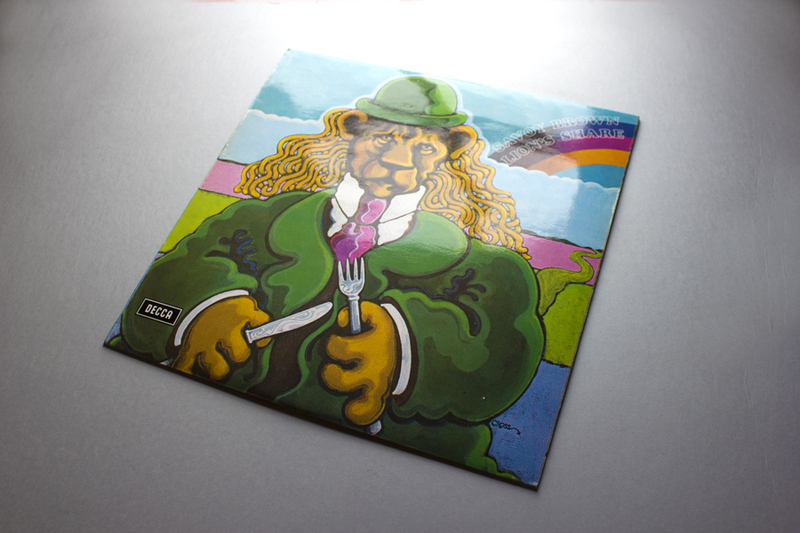 Super Vibrant Audio Only heard like this on earliest UK pressings almost CD quality on my systems for the most part in my opinion! The original 1st issue laminated front only McNeil Press Printed cover has no splits or tears super straight and clean graded excellent with just minimal, light storage wear with age only. Very Rare after 45 years! WOW! 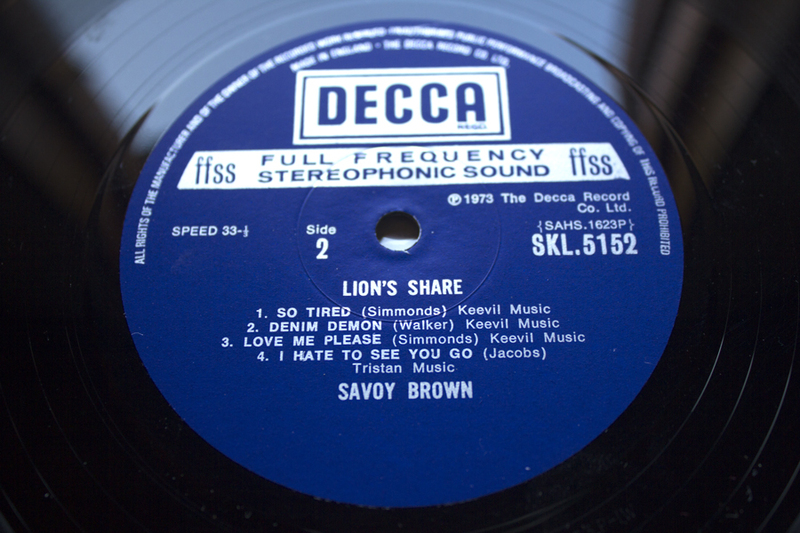 This copy of Savoy Brown Lions Share is a fantastic rich and vibrant Blues album. 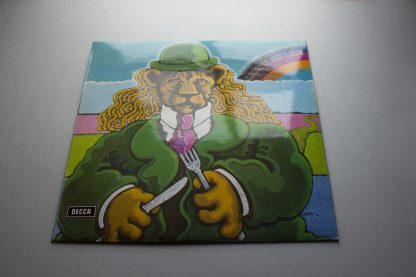 I dought that you would find a better sounding original copy in my opinion! 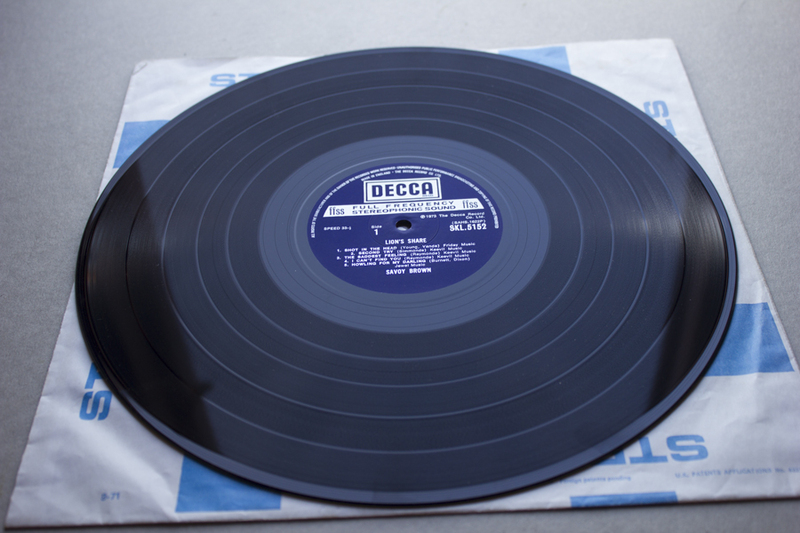 The original BOXED DECCA labels are in awesome condition! (These looks superb as new in my opinion)! Amaizingly I can not see any real spider marks/trails, even when angled to the light and of coarse little if (no) spindle ware the hole is perfectly round. This has only ever been played a handful of times by me only. 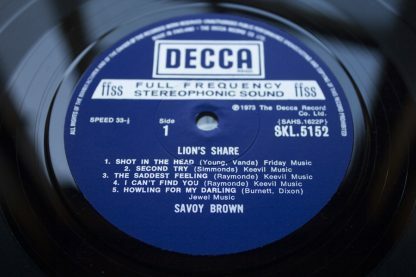 So rare for a Savoy Brown blues album that is 45 years old! Impossible to find like this! very very collectable! 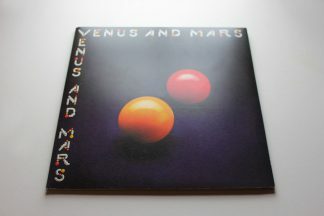 The vinyl is absolutely superb! On initial visual inspection this looks like new and still retains its sheen from new! (please note this vinyl has only ever been played a couple of times by me personally and I originally played this to record to tape! 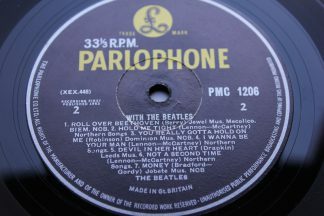 In the last 45 years this has been stored in a case with the vinyl separated from the sleeve and cover to prevent ring ware and damage. This is how I have always stored my records, and of course I played this again to play grade at very loud volume on a top system! 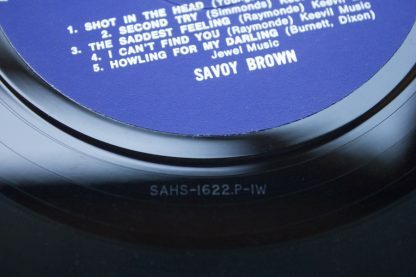 In fact even when I look at the playing surface angled to a strong light I find it hard notice no more than minor whispy surface sleeve removal marks. (Importantly,, Nothing that would cause any nasty loud constant clicks or pops). 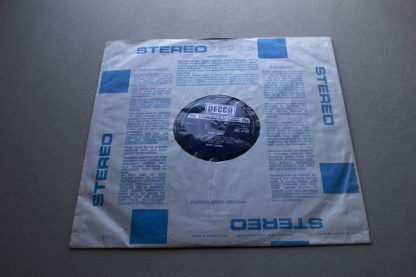 I have played this through track for track prior to listing at very very loud volume on a top system! 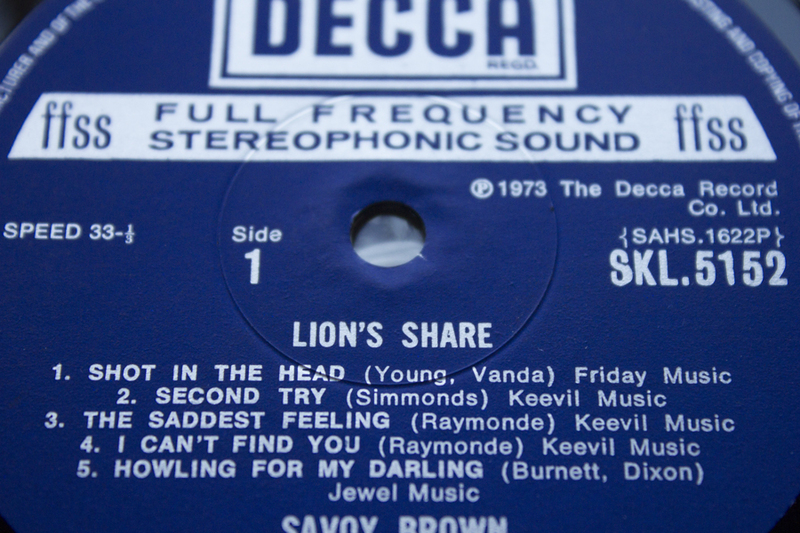 The moment the needle hits the playing surface it is obvious this vinyl has barely ever been played at all! The audio quality is as you would expect when purchased new, superbe, TOP, TOP, TOP! cristal clear and extremely vibrant through out in fact this plays truly superb This played through superb unbelievable audio seperationVery vibrant sounding audio separation only found like this on the earliest pressings. Early pressing makes all the difference! Note: Earliest “1” to”1″ Stampers! Barely any interferance noted anything there was minimal in my opinion Note: some isolated static may be heard in quieter places on in between tracks only. 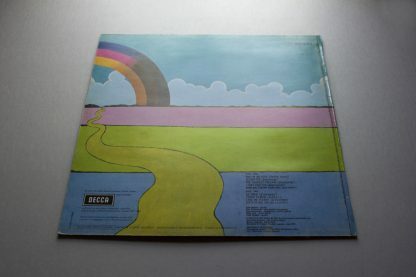 This vinyl has been stored separately from the cover in a poly sleeve for over 40 years! This is the way I always have stores my records! The vibrancy of the audio on this pressing in my opinion is almost as good as it gets for a very early 1st issue variation! 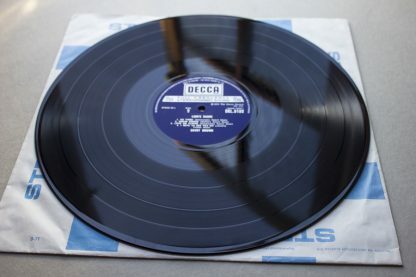 I would class myself as highly critical and this is a truly exceptional sounding vinyl Please check my completed listings of records that i have sold of this quality and you will see that i normally get it right! I would grade the audio at least near as mint!, in fact I dought you could find better in my opinion It is noted that debrit was seen on the playing surface after play indicating this will need constantcleaning after each play. Please note! That i always make this disclaimer! 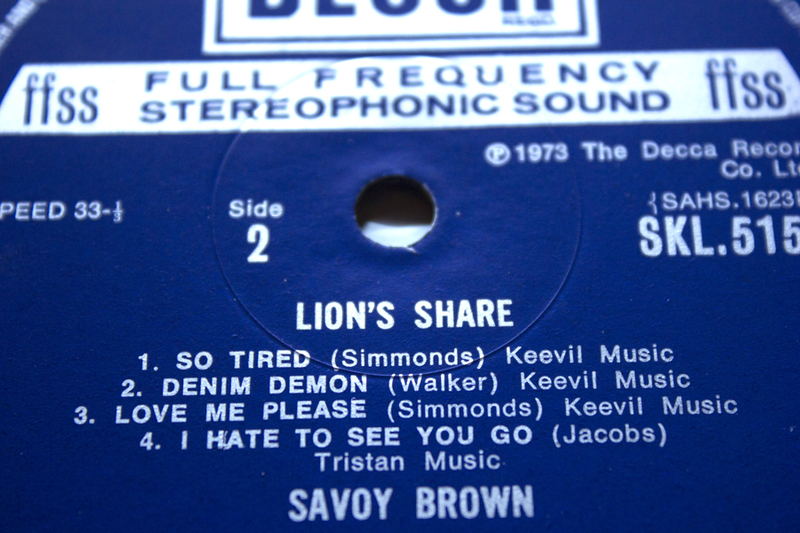 Allowances must be made for these seventies pressings. 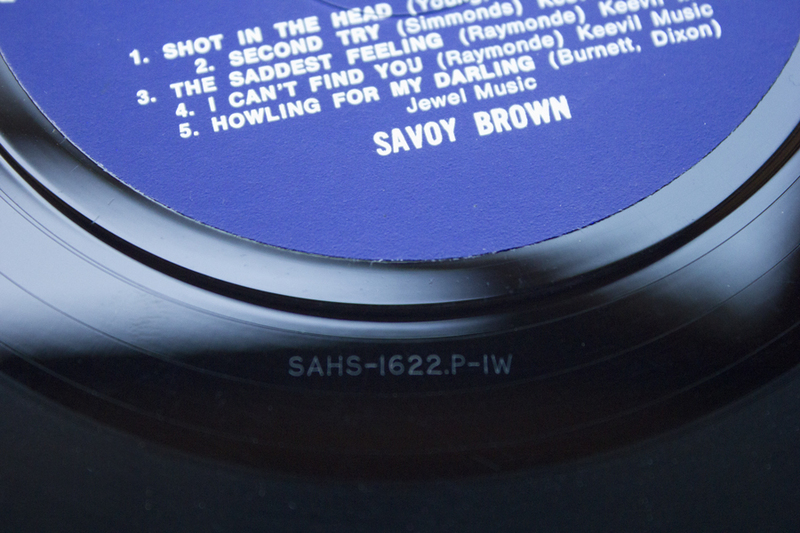 Dirt and grit trapped in between the card record sleeve and record causes surface scratches. Please allow for the odd isolated static/ pops/ticks heard as mentioned previously, certainly not consistent throughout the audio. This is a genuine 45 year old vinyl that would have originally been played on a 45 year old system! Genuinly only ever played two times ever! Points to note! This has been stored in a case laying dormant for at least 45 years! A build up of dirt and dust in the grooves from laying dormant causes static crackle\ticks! A constant clean before each play is recommended ! This would reduce any static and enhance the audio quality! This is the original 1st issue blue and white Decca poly lined record sleeve. no splits or tears. very clean. Lightr creases with age only. Very straight and clean. This is the original and earliest 1st UK issue McNeil Press Printed laminated front only cover! (No Barcode) . 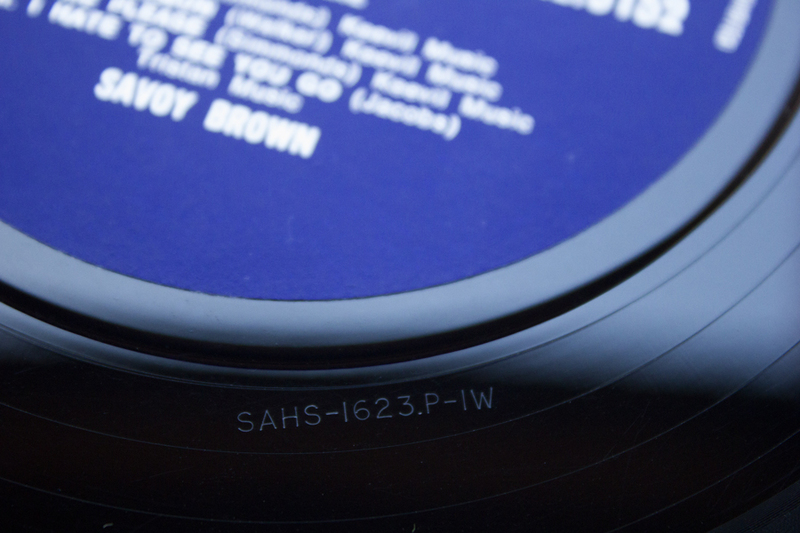 Note: This is generly exceptionally clean and straight with no edge splits or tears. All text is readable.. Note light rubbing on the rear noted but you would have to look for it to notice in my opinion. Any other storage wear marks are minimal and again not really noticed unless looked for inmy opinion. Overall truly exceptional 44 year old cover. Now always kept stored in a case with the vinyl removed from this cover for protection. This is how I have always stored my records. Cover graded at excellent in my opinion! Exception condition overall. Barely played vinyl and earliest makes all the difference for the best audio quality found on vinyl. 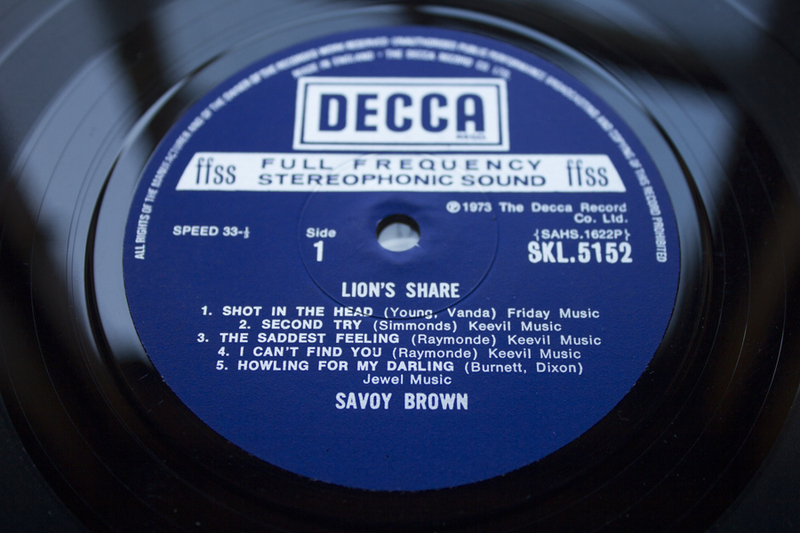 Savoy Brown Lions Share an Archive copy!